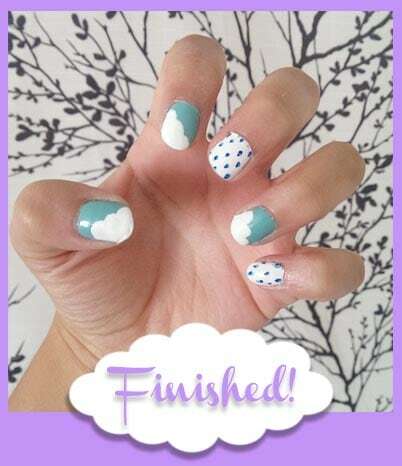 Learn how to do a cloud manicure on your nails with our easy nail art tutorial featuring clouds and raindrops. Hello, hello lovelies! I know that I can’t resist spending whatever time I can outside during summer, so I wanted to capture the look of those perfect blue skies right on my nails. 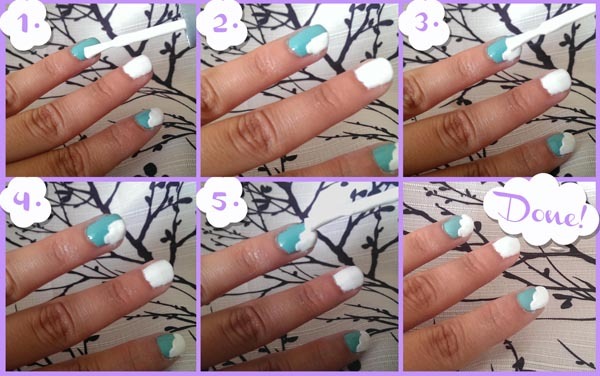 Using some cute scalloped edges and a good nail art pen, I’ll show you a simple and easy way to accomplish this fun design. Read on to learn how to get this fresh look! To start off, I’m using Wet n Wild’s Megalast nail polish in “I Need a Refresh-Mint” on my thumb, index and ring finger, and a basic white nail polish on my middle finger and pinky. Personally, I just like having a little bit of variety, but if you prefer to use just one color or style on your nails, go for it! You can’t have those endless summer skies without picture-perfect clouds drifting by! As you can see, I already have an example of a finished cloud on my index finger, but I’ll show you the steps on my ring finger. First, with the side of your brush, start around the middle of your nail and make a stroke away from you on one side. Using the side of the brush rather than the flat side helps to make a skinnier line, and keeps the tip of the cloud a little more rounded rather than straight or sharp. Bring the brush slightly lower than your first line and make another edge by curving it out. This helps to make a rounder edge since you can start painting on the first line to have a larger area to work with. Create one more line, but bring your brush almost to the tip of your nail, which gives you the final edge on your cloud. These scalloped edges create the perfect cloud shape! To be honest, late night storms are my favorite, and summer is filled with those rain-soaked nights. 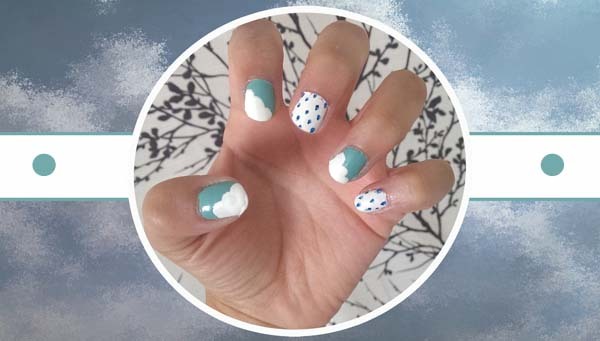 Although sometimes rain is a bummer, at least raindrops can look cute on your nails! For this part, I’m using Sally Hansen’s “I Heart Nail Art” pen in Blue on my white-colored nails. I love using these pens because of their precise tip, although you need to make sure to shake them well first. That way, you manage to get enough product out when you press down. Begin by making a small dot, then pull up slightly to create a little point, which makes a teardrop shape. Repeat the process until you have a rain shower on your nail! What’d you think of this look? 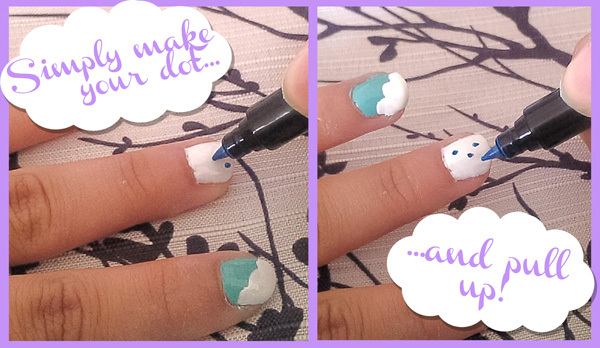 Would you wear clouds and raindrops on your nails? Do you have any favorite nail designs? 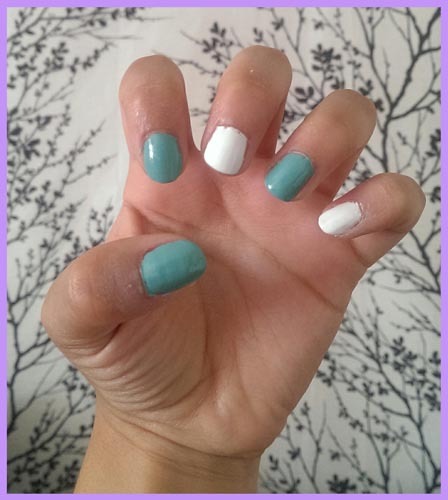 Are you a fan of cute nail looks or more elegant ones? Tell us what you think in the comments below!